Kelly Jones is one versatile writer. 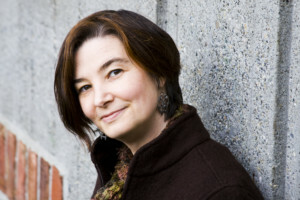 I first met her through her charming debut novel Unusual Chickens for the Exceptional Poultry Farmer. 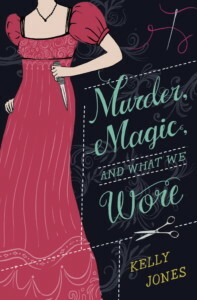 Now she takes us back in time with her new novel, Murder, Magic and What We Wore (Knopf Books for Young Readers), which School Library Journal (in a starred review!) called “a cross between Jane Austen and Harriet the spy.” It figures that a former librarian and bookseller would know what people really want to read. I suppose, at its core, Murder, Magic, and What We Wore is a story about what it means to be a girl who wants to work. Which is a bit odd, since I’ve never been a lady of leisure, and never had any desire to be one. I’ve loved Regency romances since I out-read the children’s section of my small town public library, back in the dark days before teen sections. But I know my ancestors would have been the Irish maid, not the young lady of quality. How does romance factor into it all? I get annoyed when that young lady drops everything to chase after some man. Doesn’t she have anything else she’s supposed to be doing, even 200 years ago? Yet, if marriage is how she plans to earn her living, or support her family, isn’t that her greatest responsibility? Her work? If you want to eat, you have to get your job done, whether you like it or not. Whether you’d rather be doing something else, or not. I might not ask such questions if she dropped everything to become a doctor, or to write a novel. What does that say about me? When I was a teenager, I thought about romance all the time, and I fell in love often. But I also thought constantly about what kind of life I wanted to live, what work I wanted to do – and about the work I was already doing. Every time I answered another “What do you want to do when you grow up?” I tried to decide who I wanted to become. I knew that the choices I made mattered: this was my chance to invent myself. (I didn’t know I’d reinvent myself several times after that.) I still adore stories about girls exploring love. But the stories that make me think most right now are about girls exploring work.